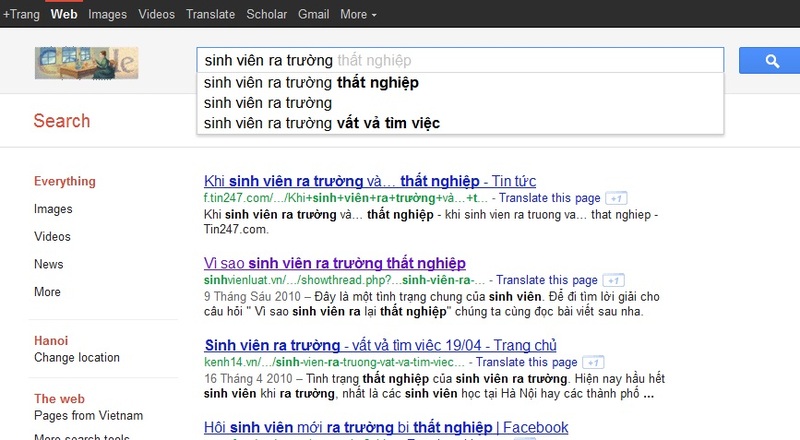 When I searched the phrase “sinh viên ra trường”, google automatically suggested me “thất nghiệp”. How sad it was! It seems that the fact the fresh graduate cannot find a job in Vietnam is not a rare happening. It becomes a nightmare of seniors at Vietnamese universities. Besides, all most all people know of that fact. Hardly any of them do not realize the possibility of getting a job irrelevant to the major they are trained at school. The very first (notorious) example appears in my mind when I read the question is the recruitment story of Intel in Vietnam in 2008: 40 were selected out of 4000 candidates and all of the 40 were sent to an University In America for training. Although there are quite a few distortions around this story, this was not the first time I heard about recruiters complaining the limited capability of Vietnamese fresh graduates, especially in terms of soft skills, computer skills and English skills. Yes, the facts are: (1) lots of college graduates are unemployed (2), many of the other do the job that’s irrelevant to their major, and (3) the two above mostly due to the shortage of soft skills, computer skills and English skills. Looking at students in my university and some other famous ones such as NEU and FTU, I think they are so active and have good English skills. However, I soon realize that in the general picture, those are not the dominance. For some people I know, only when they were at the 3rd year did they realize the importance of English and started to cram it. However, it is a little bit late and they find hard to compete with other excellent students. So, they have to accept a work with medium salary although their technical knowledge outweighs many other students who are excellent in English and receive much higher salary.